* The Fairey company of the UK had built combat aircraft from the First World War, developing new machines of increasing sophistication in the postwar period. In the 1930s, the firm built its first modern monoplane, the "Battle" light bomber, which was acquired in numbers by the British Royal Air Force (RAF). It served into the Second World War, though it proved fatally obsolete for combat service, and was relegated to non-combat roles. 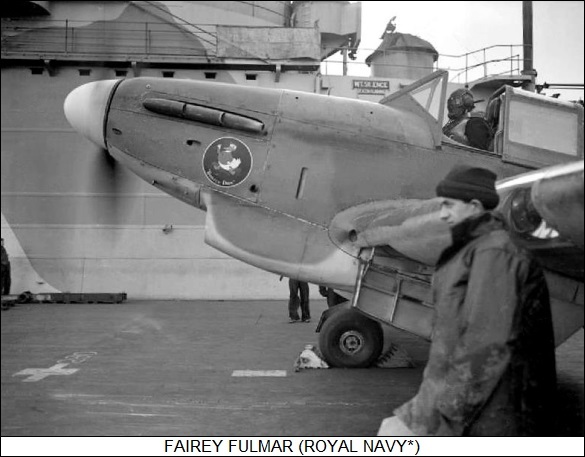 Preceding the outbreak of war, Fairey developed a two-seat carrier fighter with considerable design similarities to the Battle, the "Fulmar", for the Royal Navy's Fleet Air Arm (FAA). Although its performance was unspectacular, it proved modestly successful. 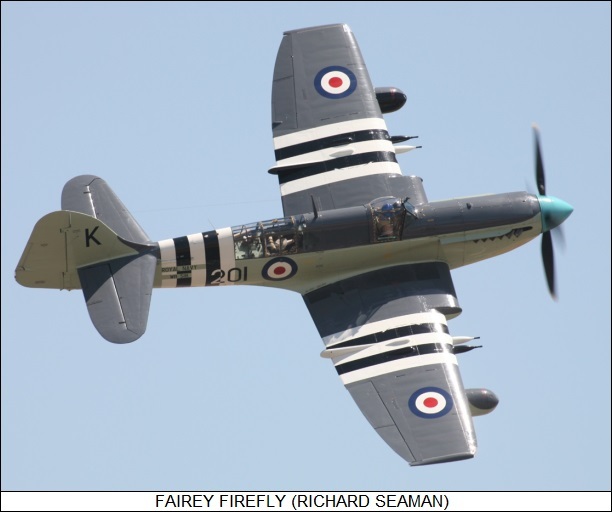 Fairey then developed a much more capable successor along the lines of the Fulmar, the "Firefly", which saw action late in World War II and in Korea. This document provides a history and description of the Fairey Battle, Fulmar, and Firefly. * In 1933, the British Air Ministry issued Specification P.27/32 for a two-seat, single-engine monoplane bomber for the Royal Air Force (RAF), capable of carrying 450 kilograms (1,000 pounds) of bombs over a range of 1,600 kilometers (1,000 miles) at a speed of 320 KPH (200 MPH), fairly aggressive requirements for the time. Most of Britain's aircraft companies submitted proposals, with prototypes being ordered of the Armstrong-Whitworth AW.29 and the Fairey Day Bomber -- designed by Marcel Lobelle, a Belgian expatriate -- for evaluation. 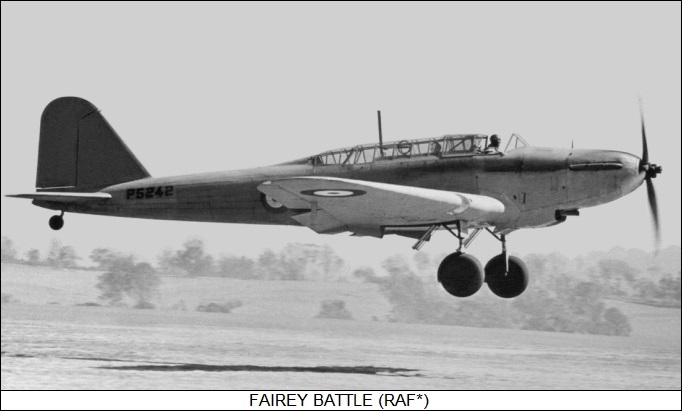 A revised Specification P.23/35 was issued in 1935, with the prototype of the Fairey "Battle", as it would become known, performing its initial flight on 10 March 1936. Even before that, the Air Ministry had ordered an initial production batch of Battles. The competing AW.29 performed its initial flight in December 1936, but it was effectively a dead issue; it suffered a landing accident not long after it took to the air, and was never repaired. The first production Battle performed its initial flight on 14 April 1937. Initial service deliveries followed during the spring and summer. Demand was such that Fairey production was complemented by contracts to Austin Motors. By the outbreak of World War II in September 1939, over 1,000 Battles had been delivered to the RAF. 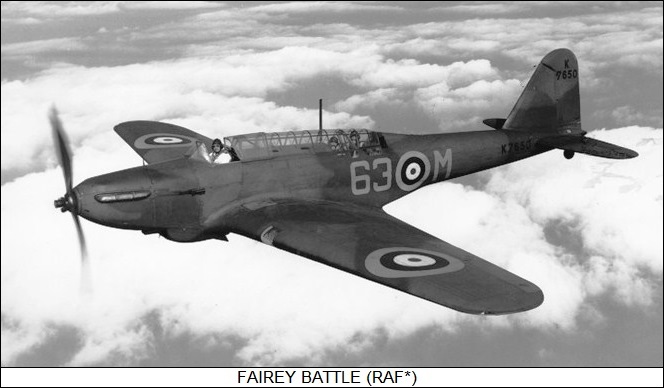 * As it emerged, the Battle was a low-wing monoplane, Fairey's first, made of mostly of light alloy. The wing had twin spars; all flight control surfaces except the all-metal flaps featured metal frames with fabric covering. The Battle was powered by a Rolls-Royce Merlin vee-12 water-cooled inline engine, driving a three-bladed de Havilland two-position variable-pitch propeller. Initial production featured the Merlin I, with later production featuring the Merlin II and still later production featuring the Merlin III. Some final production aircraft featured the Merlin IV and then the Merlin V; marks of the Battle were formally designated on the basis of the engine fit, for example an aircraft with a Merlin III being a "Battle III", but sources rarely make much of this distinction. The Battle was fitted with taildragger landing gear. All landing gear assemblies had single wheels, with the tailwheel being fixed and the main gear retracting back into fairings under the wings. There were no doors for the main landing gear. The three crew -- pilot, bombardier-observer, and radio operator-gunner -- sat in tandem under a long greenhouse canopy. The bombardier could lie down on the floor to spot a target through an optical bombsight. Gun armament consisted of a single fixed forward-firing Browning 7.7-millimeter (0.303-caliber) machine gun in the right wing and a flexibly-mounted 7.7-millimeter Vickers K gun in the rear. Some sources identify the rear gun as a Lewis gun; it is unclear if that was an alternate weapon fit, or if that was just a case of confusion between the two weapons, since they had a broadly similar appearance. Bombs were carried in little bombbays outboard of the landing gear fairing in each wing, providing a total load of four 115-kilogram (250-pound) bombs. The bombs could be hydraulically extended out of the bombbays for dive-bombing attacks. Two more such bombs could be carried on external racks. The Battle was sturdy and pilots found it "just too easy" to fly; the cockpit arrangement left something to be desired, the pilot tending to roast while the crew in the back shivered in the drafts blowing through it. However, that didn't compare to the Battle's real problem: although innovative at the time it first flew, by 1939 it was totally unacceptable for combat, being too slow and too lightly armed. The RAF was heavily reliant on the Battle for the defense of France, though it was made clear by early encounters with German Luftwaffe fighters that it was suicidally vulnerable. Obviously deficient as it was, it still had to serve because the RAF didn't have anything better. When the Germans overran the Low Countries and France in the spring of 1940, the Battle was thrown into the fight, with little result other than the slaughter of large numbers of RAF aircrew. In one of the most infamous incidents, on 12 May 1940 five Battles attacked bridges over Belgium's Albert Canal in hopes of slowing down the German advance, with all five shot down. The formation leader and his navigator were posthumously awarded the Victoria Cross. Dead heroes aren't really the stuff for winning wars; the Battle was quickly withdrawn from day combat by the RAF to prevent it from turning out more dead heroes. It served on in night bombing into the fall of 1940, in particular hitting German shipping in cross-Channel harbors to help blunt Hitler's half-baked preparations for the invasion of England. After that, its only combat service was in ocean patrols in areas where it was unlikely to encounter enemy fighters, such as Iceland and the Irish Sea. * The Battle did soldier on in good numbers through the rest of the war in secondary roles, particularly as the "Battle T" trainer. Early Battle T machines were simply Battles with twin controls -- illustrations show aircraft with a direction finder loop system in place of the third seat in the rear -- but most were built with dual distinct cockpits. Some of them were used for gunnery training, with a Bristol turret fitted instead of the rear cockpit. The Battle was used as a target tug as well, under the designation of "Battle TT.I". The Battle also served with other Commonwealth countries -- Australia, Canada, and South Africa -- and a number were obtained by Turkey in 1939, while the Irish Free Republic obtained one in 1941 when an RAF pilot landed there by mistake, the aircraft being interned and used as a target tug. The Belgians obtained 18, all built by Avions Fairey, these being the only foreign-built Battles. The South Africans flew their Battles in combat in North Africa into 1942, but though the Aussies and Canadians acquired fair numbers of Battles, they sensibly used them almost exclusively in the training role. The Canadians, fearing loss of supplies of Merlin engines, re-engined one of their Battle T gunnery trainers to a Wright Cyclone radial, but it was the only one to be powered by that engine. A total of 2,185 Battles was built in the UK, along with the 18 Belgian-built aircraft. Of British production, Fairey built 1,156 and Austin built 1,029. 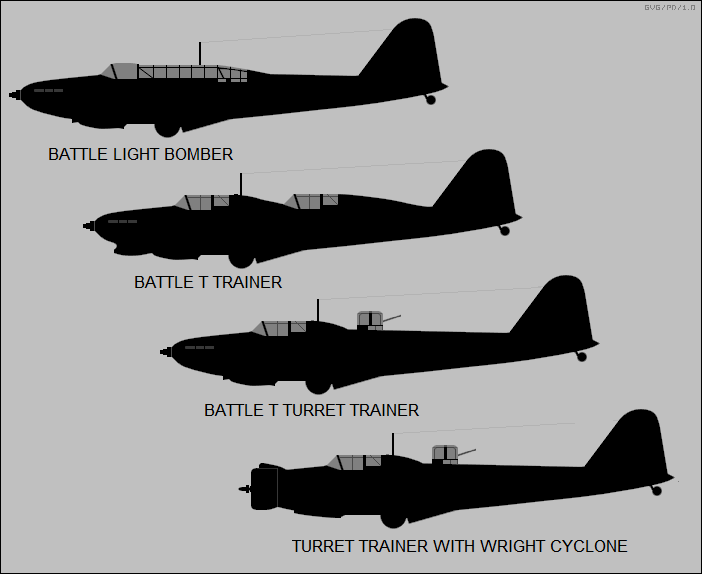 The UK production total included 100 Battle T trainers and 226 Battle TT.I target tugs; it seems a fair number of Battle bombers were also converted to trainer or target tug configuration, though the actual count is unclear. One Battle was flown from the spring of 1938 with the Bristol Taurus two-row 14-cylinder air-cooled radial. For whatever reasons, the undercarriage was modified to a fixed configuration. Two Battles were flown from early 1939 with the Bristol Hercules engine, of similar configuration to the Taurus but more powerful and more successful. Again, these aircraft had fixed undercarriage. One Battle was flown from 1938 with a Napier Dagger 24-cylinder watercooled "H" engine -- a monstrosity consisting of two flat-12 engines mated top and bottom, driving a common crankshaft. Two Battles were flown from the spring of 1939 with the Napier Sabre engine, similar to the Dagger but more powerful and more successful. One Battle was flown from before the war with a Rolls-Royce Exe, another 24-cylinder monstrosity with four banks of cylinders in an "X" configuration -- similar to the water-cooled Rolls-Royce Vulture, but with a pressure air cooling system. The Vulture was a notorious failure and the Exe fell with it. One Battle was flown from the summer of 1939 with a Fairey H.24 Prince 4 AKA Monarch engine, a 24-cylinder "H" engine along the lines of the Napier Dagger. Some sources suggest that a Battle also flew with a Fairey H.16 Prince, an earlier 16-cylinder "H" type engine. One Battle was flown with the advanced Merlin XII engine. Sources also suggest a Battle was used to evaluate the Merlin's successor, the Griffin. Although the Battle served well in the training role, it is sadly not in general remembered fondly. For the most part, in the first years of World War II the RAF was saddled with inadequate bomber types. Few turned out to be quite so inadequate as the Fairey Battle, which is today honored only in its association with futile valor. A few Battles survive as static displays, but none remain flying. * After the emergence of Nazi rule in Germany in the 1930s, Britain gradually and somewhat reluctantly began to re-arm for war. At the time, the Royal Navy's Fleet Air Arm (FAA) was equipped with biplane fighters, which were clearly becoming rapidly obsolescent. Work had been performed at Fairey from 1934 on a single-engine light / dive bomber for the RAF to replace the Battle under Air Ministry Specification P.4/34. Initial flight of the first of two prototypes was on 13 January 1937, the powerplant being a Rolls-Royce Merlin II water-cooled 12-cylinder inline-vee engine. Bombload was to consist of a single 110-kilogram (250-pound) bomb under each wing; the airframe was stressed for dive-bombing. The new light bomber was an improvement on the Battle as far as looks went, but its performance wasn't much better. The Air Ministry selected the Hawker Henley, a light bomber derivative of the Hawker Hurricane, instead. The whole light bomber effort would come to little, with the Henley being built in small quantities, to end up doing nothing more than towing targets. However, the next year the Air Ministry issued Specification 0.8/38 for a two-seat carrier-based fighter; the second Fairey light bomber prototype was accordingly modified as a "flying mockup" of the naval fighter, with trimmed wings and a lowered tailplane. After some fussing, including elimination of a requirement for operations from floats, the Air Ministry issued a definitive specification for the naval fighter. 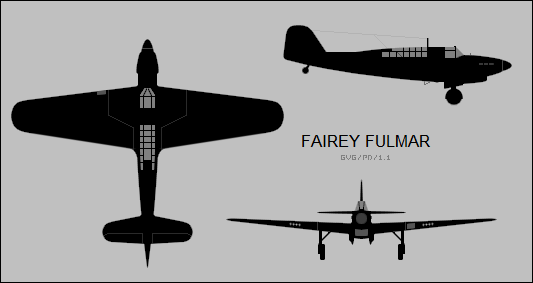 Seven weeks later, in mid-March 1938, Fairey came back with a detailed design. Flight testing of the two light bomber prototypes gave the Air Ministry enough assurance to immediately issue a contract for 127 of the naval fighters, to be named "Fulmar" after a ocean bird. After the Munich Crisis of September 1938, the contract was increased to 250 machines, though Fairey officials warned the Air Ministry that production couldn't start until a new factory at Heaton Chapel in the city of Stockport was completed. Initial flight of the first "Fulmar Mark I" was on 4 January 1940. This machine was not quite production standard, being fitted with a modified Merlin III engine; the plan was to fit production aircraft with the supercharged Merlin VIII, providing 805 kW (1,080 HP), the first full-specification machine performing its initial flight on 6 April 1940. It was then passed on to the Aircraft & Armament Experimental Establishment at Boscombe Down for initial trials, to then perform carrier trials on the HMS ILLUSTRIOUS. Trials proving successful, the Fulmar went into full production, with 159 delivered by the end of 1940. * The Fulmar was a slim, appealing aircraft, with some broad resemblance to the Battle, but more elegant in appearance. It was of all-metal, flush-riveted construction, with low-mounted wings, a conventional tail arrangement, and retractable tailwheel landing gear. Control surface layout was straightforward, with a large single-piece flap inboard and an aileron outboard on each wing, with elevators and rudder on the tail. There were four 7.7-millimeter (0.303-caliber) Browning machine guns in each wing for a total of eight guns, with an ammunition load of 750 rounds per gun. All landing gear had single wheels, with a fixed tailwheel and the main gear hinged in the wings to retract towards the fuselage, giving the aircraft a comfortable wide track. There was a yoke-style arresting hook under the rear fuselage. The wings pivoted flat 90 degrees backwards from outboard of the landing gear in a jacknife fashion for carrier storage, with the big flap flipped up on top of the wing to allow fit. The radio operator / navigator / observer sat under a "greenhouse" canopy on the Fulmar's spine, with both the pilot and back-seater using sliding canopy sections to get in and out. The back-seater had a handhold / step to help him clamber in. Pilots found the Fulmar maneuverable and generally pleasant to fly, though when heavily laden it was unsteady around its longitudinal axis. The only major drawback to the machine was its performance, with a top speed of only about 400 KPH (250 MPH) and a sluggish rate of climb. The low performance was not a surprise, since the Fulmar had effectively the same powerplant as the Hurricane, but was loaded down with two aircrew and carrier kit. Obviously nobody in the Air Ministry or FAA had believed such an aircraft could fight on even terms with a German Messerchmitt Bf 109 or other modern land-based fighter, but that limitation was accepted on the basis that the Fulmar would provide air cover for deep-water operations -- where Axis patrol and attack aircraft would be a threat, but a short-ranged fast fighter like the Bf 109 would not. A navigator in the back seat was seen as necessary for oceanic operations, and could also serve as an observer, carrying binoculars and possibly a hand-held camera for scouting flights. Having accepted the need for a larger aircraft, the Fulmar was also designed with a large fuel supply, giving it twice the endurance of a Hurricane, as well as capacity for twice as much ammunition. In any case, the Fulmar was superior to anything else the FAA had at the time, and it was what could be obtained quickly until something better was obtained. After delivery of 250 Fulmar Mark I machines, production went on to the "Fulmar Mark II", which featured reduced weight, a Merlin 30 engine with 970 kW (1,300 HP), a new propeller, a thousand rounds per gun, and other changes. The Mark II's major recognition feature was the addition of a scoop on either side of the undernose radiator cooler inlet, cluttering up the Fulmar's lines slightly. The increased power and reduced weight of the Mark II did not actually result in a much faster aircraft, but climb rate was significantly improved, and of course aircrew appreciated the greater margin of performance for carrier takeoffs. A new, more powerful radio set was introduced in early 1942 that considerably enhanced the Fulmar's usefulness in the scouting role. Some sources claim that the last-production Mark IIs were armed with 12.7-millimeter (0.50-caliber) Browning machine guns, but it is difficult to find details. 350 Mark IIs were built, with the last delivered in February 1943, for a total of 600 production machines. Sources actually give 602 Fulmars in all, but that may be counting the two Fairey Light Bomber prototypes. * Despite its limitations, the Fulmar distinguished itself early in the war, proving formidable in air combat with the Italians during early Malta convoys. During the Battle of the Atlantic, it was launched off rocket catapults mounted on merchant vessels to defend against German patrol aircraft, though it was quickly replaced in this role by the Hawker Sea Hurricane. The lack of a rear gun for the back-seater was regarded as a major weakness; some sources claim that a 7.7-millimeter gun was fitted to some aircraft, or that the back-seater sometimes carried a submachine gun. One source even claimed that sometimes the back-seater would throw out a bundle of loose sheets of toilet paper, which tended to confuse a pursuer as they scattered in the slipstream. At its peak, in 1942, the Fulmar equipped six FAA squadrons. By 1943 it was being relegated to second-line service, with the Supermarine Seafire and then the Fairey Firefly -- see below -- taking over. A hundred Mark IIs were fitted with airborne intercept (AI) radar and used as trainers for the Fairey Firefly, discussed below. The Fulmar was generally out of service by the end of the war. At least one survives, at the Royal Navy FAA Museum at Yeovilton in the UK; none remain in flying condition. * Even before the Fulmar performed its first flight, the FAA was casting about for something better. Requests for the design of an improved naval fighter had been issued by the Air Ministry in 1939, with "N.8/39" specifying a two-seat fighter with fixed gun armament -- meaning something in the class of the Fulmar, but more formidable -- while "N.9/39" specified a fighter with turret armament. Turret fighters, like the Boulton-Paul Defiant, proved a nonstarter after the shooting began, and so the N.9/39 specification was amended to a single-seat naval fighter with fixed armament. A Fairey design team under H.E. "Charlie" Chaplin came up with a single design that met both requirements. The Air Ministry liked the idea, replacing the two 1939 requirements in early 1940 with "N.5/40F", which was essentially written around the Fairey design. The new aircraft had a configurational resemblance to the Fulmar but was more formidable, with armament of four Hispano Mark II 20-millimeter cannon and a Rolls-Royce Griffon water-cooled vee-12 engine, then in development. In maturity, the Griffon was expected to produce about 1,500 kW (2,000 HP). Two prototypes of the "Firefly", as it was named -- following in the path of the Fairey Firefly biplane fighter of the 1920s, which did not enter production -- were ordered at the outset, though the number of prototypes would increase to four. Initial flight of the first prototype was on 22 December 1941, with test pilot Christopher Staniland at the controls. The second prototype flew in June 1942, though it crashed on 26 June, killing Staniland. The third prototype flew in August 1942, with the fourth -- apparently a ground-test machine -- being delivered in September. Trials proved somewhat protracted; although a production batch of aircraft had been ordered even before the flight of the first prototype, initial deliveries of the "Firefly Fighter Mark I (F.I)" weren't until the spring of 1943, and the type didn't get into operational service until late in that year. Incidentally, no single-seat version of the Firefly would ever fly. * The Firefly was of all-metal construction and of conventional configuration, with a low-mounted wing, taildragger landing gear, and a yoke-style arresting hook forward of the tailwheel. Nobody could look at the Firefly and not think it was a "bigger and better" Fulmar, particularly with its two-seat configuration, the pilot sitting under a bulged "Malcolm hood" type canopy, which slid back to open, while the navigator / observer sat in a "greenhouse" in the rear fuselage like that of the Fulmar -- though it didn't slide open, instead being entered through a window panel hinged on the left. The back-seater had a step with a spring-loaded door in the fuselage to help him get in and out. In the initial prototypes the canopy was not bulged, resulting in a poor view; early Mark I production did have the bulged canopy, but it was later raised to further improve the view. 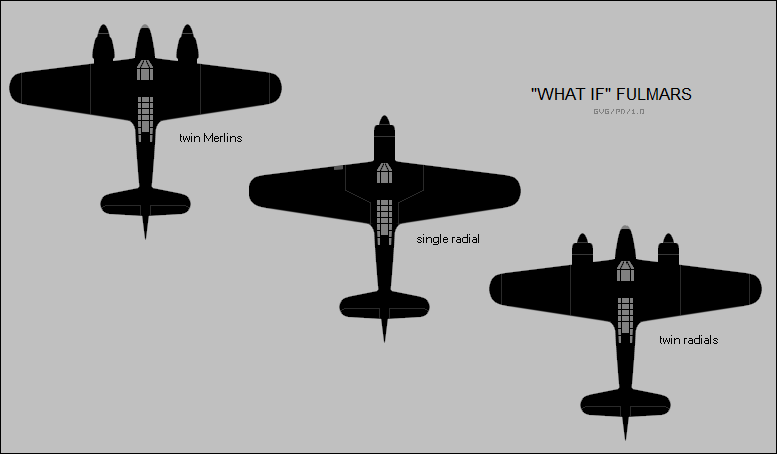 The resemblance to the Fulmar was superficial, the Firefly being a clearly meaner-looking and somewhat bigger aircraft. The wings, unlike those of the Fulmar, had an elliptical form, reminiscent of that of the Supermarine Spitfire. Instead of jackknifing back along the fuselage like the wings of the Fulmar, the Firefly's wings were manually folded back to lay flat against the fuselage, like the wings of Grumman aircraft like the Hellcat and Avenger. Control surface arrangement was conventional -- except for large-area Fairey-Youngman flaps, which extended well behind the wing to add to wing area, giving a low stall speed. All three landing gear assemblies were retractable, the main gear hinging in the wings to retract towards the fuselage. Early production Firefly Mark I machines were powered by the Rolls-Royce Griffin IIB engine providing 1,290 kW (1,730 HP), driving a three-bladed Rotol (Rolls-Bristol) constant-speed propeller; later Mark I production used the Griffin XII, with 1,485 kW (1,900 HP). There was fuel tankage behind the front cockpit, with a capacity of 664 liters (146 Imperial gallons / 175 US gallons), and auxiliary tankage in the leading edge of the wing center section with a capacity of 209 liters (46 Imperial gallons / 55 US gallons), for a total of 873 liters (192 Imperial gallons / 230 US gallons). The four Hispano 20-millimeter cannon were loaded with 60 rounds each. Stores were carried under the outer wings; two external fuel tanks could be carried, with a capacity of 205 liters (45 Imperial gallons / 54 US gallons) or 410 liters (90 Imperial gallons / 108 US gallons), or warloads up to two 450-kilogram (1,000-pound) bombs. A common load, though not implemented at the beginning of the Firefly's service career, was 16 60-pounder unguided rockets, carried two to a pylon for eight under each wing. The Firefly carried other stores through its operational history, including depth charges, naval mines, and air-sea rescue (ASR) packs with an inflatable dinghy and other survival kit. Firefly Fighter-Reconnaissance Mark I (FR.I): F.I with ASH radar pod clumsily mounted on a rack under nose, as well as improved gyro gunsight. A number of F.Is were updated to a similar standard and given the designation of "FR.IA". Apparently their "reconnaissance" role was strictly maritime, the ASH radar being used in the "air to surface" role to spot vessels at sea. No cameras were fitted, though no doubt the back-seater could use a hand-held camera as needed. Firefly Night Fighter Mark I (NF.I): FR.Is with minor changes for the night fighter role, such as exhaust flare suppressors. Firefly Night Fighter Mark II (NF.II): The NF.II was originally supposed to have been the night-fighter version of the F.I, with ASH radar mounted in a pod on the wing and the aircraft fuselage stretched to preserve center of gravity. The NF.II proved "snakebitten", leading to the introduction of the NF.I in its place, and most or all of the NF.IIs built were converted to NF.I standard. Sources give production figures as 455 F.Is, 236 FR.Is, 140 NF.Is, and 37 NF.IIs -- since the NF.IIs ended up being NF.Is, that means a total of 177 NF.Is. There is some fuzziness in these quantities, because in many cases machines that supposedly were built as one subvariant ended up as another, muddying the trail. Since they were all Mark Is -- the Mark IIs became Mark Is in the end -- the issue of numbers of subvariants is basically finicky. * The Firefly was enthusiastically welcomed by FAA pilots, the aircraft being clearly more formidable than the Fulmar and remarkably agile. However, it was to an extent an example of running fast to stay in one place: while the Griffon engine did much to give the Firefly better performance, it was still a two-seat aircraft, and couldn't match the performance of Griffon-powered single-seat fighters like late-mark Spitfires. The two-seat configuration did give the Firefly additional capabilities, of course, and the FAA would find the machine very satisfactory as a multi-role combat aircraft. The Firefly's initial combat action was in July 1944, with aircraft flying from the HMS INDEFATIGABLE participating in attacks on the German battleship TIRPITZ, docked in a Norwegian fjord. By early 1945, Fireflies were in combat against the Japanese, starting out in January 1945 in strikes against Japanese-held Sumatra and ultimately, by the end of the conflict in the Pacific, over the Japanese homeland itself, with Fireflies not only participating in strikes and rescue activities, but also scoring a series of "kills" against Japanese aircraft. By the end of the conflict, the FAA was flying eight squadrons of Fireflies. * Unlike many other aircraft in use during the war, the FAA retained the Firefly in service in the immediate postwar period as a firstline aircraft, with an improved series introduced. A "Firefly F.III" was an F.I refitted with a new Griffon 61 engine featuring two-stage instead of single-stage supercharging, and providing 1,150 kW (1,540 HP). This aircraft began trials in May 1943; the new Griffon series required a bigger radiator and due to the drag, the F.III showed no improvement in performance. It was abandoned, with work then focusing on the "Firefly F.IV". Four Mark IV prototypes were built, one being a conversion of the Mark III prototype, the others being conversions of F.Is. Initial flight of the first prototype was on 25 May 1945. The primary change was a two-stage Griffon 72 engine with 1,565 kW (2,100 HP) in a substantially revised installation, the radiator being moved to the leading inboard edges of the wings; the new engine drove a four-bladed Rotol propeller. One machine was later evaluated with a contrarotating propeller in hopes of dealing with the strong torque of the powerful Griffon engine, but the contraprop did little good, and so all Fireflies from the Mark IV retained the four-bladed Rotol prop. Further refinements were added during prototype evaluation: a clipped wing, the radiators augmenting wing area and so permitting a shorter span to improve roll rate; a bigger and reprofiled tailfin; and ASH radar in a wingtip pod. The wing tanks having been lost with the installation of the radiators in their place, the left wing was fitted with a fuel tank pod matching the ASH radar pod on the right. The fuel tank pod had a capacity of 250 liters (55 Imperial gallons / 66 US gallons), and the ASH pod could be replaced with a fuel tank pod if desired. The cannon were updated to short-barreled Hispano Mark V cannon, replacing the long-barreled Mark II cannon. The first production "Firefly FR.4" -- the British had decided to give up on Roman numerals by that time -- flew in May 1946; it featured the definitive Griffon 74 engine, with the same power ratings as the Griffon 72 but with technical improvements. Initial deliveries to service squadrons were in August 1947, and 160 FR.4s were built. * The FR.4 was something of an interim type, the FAA deciding that Firefly really was a multirole aircraft, leading to the "Firefly FR.5", which was designed to quickly reconfigured to the antisubmarine warfare (ASW) and night-fighter roles -- with the designation changing to "AS.5" and "NF.5" respectively after conversion. The AS.5 could carry depth charges and sonobuoys under the wings, with an airfoil-like underwing pod eventually built to carry the sonobuoys. The first Mark 5 performed its initial flight in December 1947. After initial production, the Mark 5 was also given a powered wing-fold system. A total of 352 Mark 5s was built. They began to reach FAA units in 1948; after the Korean War broke out in 1950, FAA FR.5s saw intensive combat in the conflict in the attack role, originally operating from the HMS TRIUMPH, but later flying from the HMS THESEUS. They were complemented by Fireflies of the Royal Australian Navy (RAN), see below. * Although the Firefly fought with distinction through the Korean War, by that time its days as a first-line combat aircraft were clearly numbered, but the FAA still saw it as useful in the ASW role. That led to the "Firefly AS.6", which was much like a Mark 5 except for the deletion of the cannon and changes to wiring to accommodate improved ASW combat avionics. Initial flight of the first AS.6 was in March 1949, and 133 machines were built; some sources give different numbers of Mark 5s versus Mark 6s, not surprising since they were so similar, but the total of the two is more consistently given as 485. The AS.6 remained in service to the mid-1950s, when it was replaced by the Fairey Gannet. There was thought of a more optimized ASW version of the Firefly, the "Mark 7" or "AS.7" which was something of an odd hybrid design. It featured a single-stage Griffon 59 engine with a "beard" radiator, no need being seen for a two-stage Griffon for the ASW role, and it featured a full-span wing with a revised planform, though fitted with the ASH radar / fuel pods of the Mark 4 series. It had a short forward fuselage plug forward of the wings, as with the Mark III; a new tall tailfin; a fixed tailwheel; and the back-seater "greenhouse" changed to a bulged frameless configuration, with two seats in the back instead of one. The development program didn't go well and the Mark 7 wasn't judged suitable for operational service; only 151 machines were built, about half of the planned production, with most or all going into service for ASW training as the "T.7". The "Firefly T.1" trainer, derived from the Mark I fighter, eliminated the back-seater's greenhouse, replacing it with a second bulged pilot's canopy in a raised position on the back for the flight instructor. Armament was deleted -- though a similar "T.2" conversion was performed that retained a single cannon in each wing and provision for external stores. There were 34 T.1 and 54 T.2 conversions. There was also a "Firefly T.3", which was just an FR.I with some training gear fitted, but not dual pilot canopies. The ASH radar was eventually removed from these machines. There were about 50 conversions. Two "Firefly T.5" trainers, with the dual pilot cockpits on the FR.5 airframe, were built by conversion in Australia. The "Firefly TT.1" target tug, built for foreign users, featured tow target winch gear and fixed underwing fuel tanks. There were about two dozen conversions, though trying to track down the exact number is confusing since some of them changed hands. A comparable target tug conversion was performed with the "TT.4", based on the Mark 4, with these machines operated by the FAA. 28 conversions were performed. The Australians converted two FR.5s to target tugs as the "TT.5", and four AS.6s to target tugs as the "TT.6". 34 Mark 7s were actually built new as radio-controlled target drones designated "U.8", in addition to the 151 AS.7s / T.7s produced. They were stripped of unnecessary gear, given radio-control / autopilot systems, and fitted with camera pods on the wingtips for scoring. While it is unclear why anyone would have wanted to build Fireflies as targets from the outset, it is plausible they were ordered as AS.7s that nobody ended up wanting -- and for want of anything better to do with them, instead of canceling them, they were completed as target drones. Two Mark 7s used in development of the U.8 drones were designated "Mark 7D", while six others used in the program were designated "T.8". These were strictly trials conversions, as was the mysterious single "U.7" used by the Royal Aeronautical Establishment. Following U.8 production, 40 Mark 5s were converted to target drones with the designation of "U.9". The U.8s and U.9s were used for missile development trials. Australia obtained a total of 108 Mark 5/6 Fireflies, flying them in combat in Korea. It appears they were mostly or all new-build machines. As mentioned above, some of the Aussie machines were converted locally to T.5 trainers, as well as TT.5 and TT.6 target tugs. Aussie Fireflies were generally out of service by the mid-1950s. The Royal Canadian Navy operated 62 Fireflies, including 26 FR.Is, 3 T.1s, 3 T.2s, 12 FR.4s, and 18 AS.5s. It appears they were mostly or all new-build machines. They were generally passed on to other air arms in the early 1950s. The Royal Netherlands Navy (MLD) obtained a total of 89 Fireflies, most of them new-build. The initial batch was of 30 FR.Is, obtained in 1945, followed by 40 FR.4s in 1946, these aircraft seeing action in the wars of independence in the Dutch East Indies. A batch of 15 NF.5s was obtained in 1949, with four ex-Canadian AS.6s machines obtained in 1953 -- two of the Canadian machines being used as spares hulks. The Dutch Fireflies remained in service through the 1950s. Denmark obtained a total of six hand-me-down Fireflies for use as TT.1 target tugs. The first two were ex-FAA machines converted by Fairey, the other four were ex-Canadian FR.Is converted in Denmark. Ethiopia obtained a total of 23 hand-me-down Fireflies, the initial batch being 8 FR.Is and one T.2 reconditioned by Fairey, with all delivered in 1951. They were followed by 14 ex-Canadian machines, including 9 FR.Is, 3 T.1s, and one T.2. They operated into the 1960s, to finally be parked and allowed to rot, with a number of eventually saved by warbird collectors for restoration. India obtained a total of 10 Firefly target tug rebuilds, consisting of an initial order of 5 TT.1s in 1953 and a follow-up order of 5 TT.4s in 1956. They served into the 1960s. 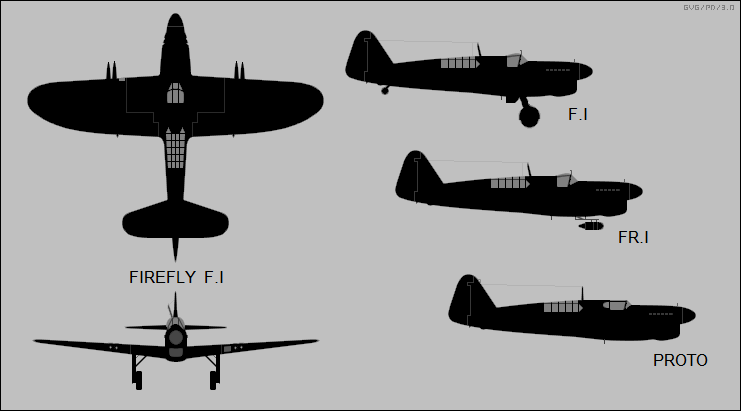 The Thais obtained a total of 12 ex-FAA Fireflies in 1951, including 10 FR.Is and 2 T.2s. They were only flown into 1954. Sweden obtained a total of 19 TT.1 target tug rebuilds from various sources from 1948, these machines being operated by a commercial firm, Svensk Flygjanst AB, under military contract. They were all retired by the mid-1960s. No Fireflies remain in operational service, but there's a fair number of machines on static display, and a few are still flying as airshow "warbirds". F.I:              455       Standard shipboard fighter. FR.I:             236       Fighter-reconnaissance with ASH radar. FR.IA:                   ? Conversions of F.I to FR.I. NF.I:             140       Night fighter version of FR.IA. NF.II:             37       Night fighter, all completed as NF.I. Mark 5:           352       Including FR.5, NF.5, AS.5. AS.6:             133       AS.5 with improved kit, no cannon. T.1                    34   Unarmed 2-cockpit trainer mod of Mark I.
T.2                    54   Like T.1 but with twin cannon. T.3                    50? FR.I with minor changes for training. T.5                     2   Aussie 2-cockpit trainer mod of Mark 5. Mark 7:           151       Originally AS.7s, then T.7 ASW trainers. TT.1                   24? Mark I converted to target tug. TT.4                   28   Mark 4 converted to target tug. TT.5                    2   Aussie target tug conversion of Mark 5. TT.6                    4   Aussie target tug conversion of AS.6. U.8:               34       Mark 7s built as targets. U.9                    40   Mark 5s converted to targets. The twin Fulmars have main landing gear that retracts back into the engine nacelles, the searchlight moved to the nose from the wing, and a revised wing-fold scheme -- the outer wings fold upward, with the wingtips folding down to accommodate the low hangar ceilings in Royal Navy carriers. Armament remains eight 7.7-millimeter Brownings. Other folks have come up with similar WHAT-IF designs for the Fulmar, but I haven't seen any models along such lines yet. It's unclear if the FAA ever considered a twin-engine carrier fighter in the prewar / early war period; it seems in that era nobody really thought highly of operating multi-engine aircraft off of carriers. Incidentally, while I haven't seen most of the old aircraft I write about flying around, I actually did spot a Firefly one day from my back yard, clearly flying in for a regional airshow. Alas, I wasn't in a position to get a good photo of it. THE FAIREY BATTLE by Philip J.R. Moyes, PROFILE PUBLICATIONS, date unknown but presumably written in the 1960s. It's one of the few sources available with any details on the Battle, an aircraft that most preferred to forget. BRITISH WARPLANES OF WORLD WAR II, edited by Daniel J. March, Aerospace Publishing LTD, 1998. 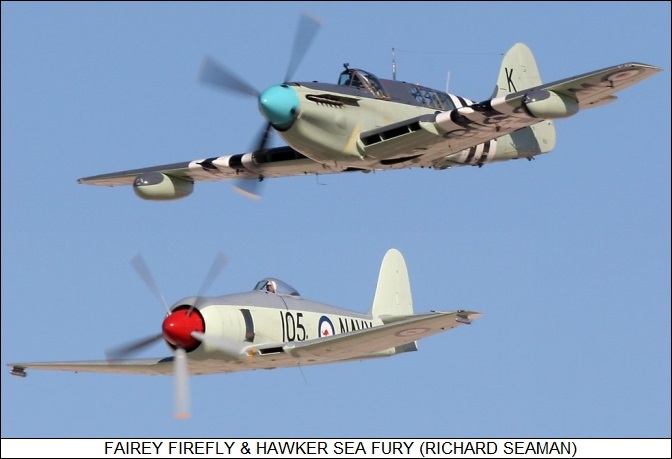 "Fairey Firefly Variants" by William Harrison, WINGS OF FAME, Volume 12 / 1998, 112:141.
v1.0.1 / 01 sep 13 / Review & polish. v1.0.2 / 01 aug 15 / Review & polish. v1.0.3 / 01 jul 17 / Review & polish.